Worrying about the hotel bills instead of just enjoying your vacation? Worry no more! There are resorts that offer all-inclusive packages that are becoming increasingly popular because of its convenience. At an all-inclusive resort, you normally pay a fixed price, then just sit back, relax, and enjoy all the inclusions of the package such as, meals, snacks, and beverages, transportation, water sports, entertainment facilities, as well as the taxes and service charge. #1 - Hidden Valley Springs (Laguna): Are you looking for a place to relax and unwind? With its mountainous scenery, volcanic terrain, and natural landscapes, this is the perfect one for you! Included in their package is the guided tour of Hidden Valley's hot springs, a naturally heated volcanic hot-spring bath, and a delicious buffet of Filipino cuisines for breakfast, lunch and dinner. You can also choose to rent a casita or a rest house for your stay. #2 - Infinity Resort and Spa (Puerto Galera): Take a break from all the stress and explore the endless opportunities this resort could offer. Their all-inclusive package includes an overnight accommodation, round trip land transfers from ports of Muelle or White Beach, unlimited fish spa, 1-hour Malasimbo signature massage, complimentary access to the resort's infinity pool and outdoor jacuzzi, fitness gym, kayak and entertainment room (PS4, billiard, darts, board games, and videoke room), all meals with drinks, and taxes and service charge. This promo is available until September 30, 2017 only, so hurry up and book now! #3 - Dedon Island Resort (Siargao): Indulge in the luxury of this intimate resort as they help you plan your perfect getaway that is covered by an all-inclusive fee. You can choose from their wide array of activities such as surfing, paddle boarding, canoe, island hopping, spa, yoga, cooking classes for kids—name it and they have it! It is also up to you whether you want a breakfast in bed, picnic lunch, candlelit dinner, or anything, with each meal tailored to your diet and cravings. 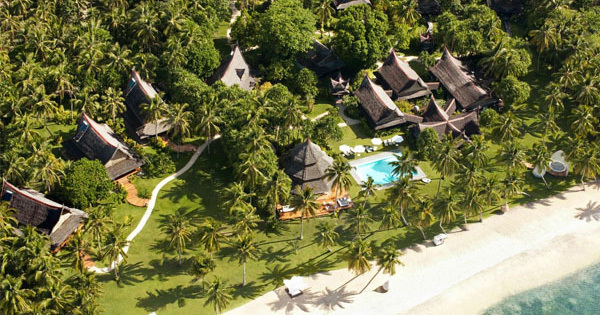 This resort with only 9 villas is truly a hidden paradise you almost just want to keep to yourself. #4 - Misibis Bay Resort (Albay): Experience a balance of relaxation and adventure with this private island resort located near the famous Mayon Volcano. They offer different packages, mostly having full board meals alongside the room accommodation and round trip transfers. Take advantage of the countless activities as some packages also include ATV rides, water sports, and Albay cruise, according to your preference. #5 - Shangri-la Mactan Resort & Spa (Cebu): Satisfy your taste buds with different cuisines as Shangri-la Mactan Resort take you to an appetite adventure with their "Sip.Savour.Save." promo. Aside from the breakfast buffet every day, you will be given a dining credit worth USD 50 per stay. They also have other packages that include the accommodation, buffet breakfast and dinner, unlimited use of snorkel sets and kayaks, complimentary resort activities, laundry service, and round-trip shuttle bus transfers to/from the airport.